When I was a child, a blue Kraft macaroni and cheese box could only mean one thing: My parents were going out. You see, this was the go-to-dinner for nights we had a babysitter. Luckily, my brother and I loved mac and cheese so we were pretty stoked about being abandoned for the night. 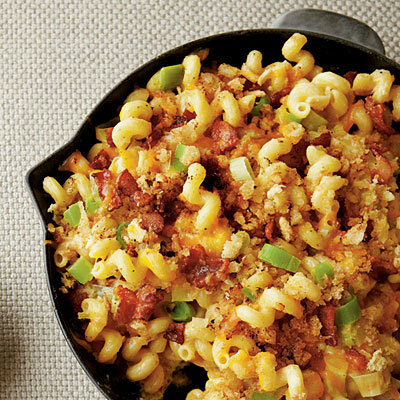 For me, mac and cheese is one of those wonderful comfort foods. I think that's the key element of comfort food—that it has some resonating cord in your history. Years later I still smile fondly when I think about mac and cheese, recalling all the fun my brother and I had together. Perhaps a favorite memory is when we threw strawberry jello squares on the ceiling, watched them slowly peel off and then scrambled to try to catch them. [What the babysitter was doing, I have no idea.] While providing entertainment for hours, the act also left undeniable red square marks all over the ceiling. Apparently our parents didn't share our same decorating aesthetic. While there seems to be an infinite number of mac and cheese recipes out there, this one caught my eye because it looked particularly light. Whatever. If you're gonna make mac and cheese, you should make something really luxuriously indulgent, right?! This one meets that definition with two types of cheese along with bacon, leeks and cream. Did I mention how freaking delicious it was? I think I should rename it "crack and cheese." It was hard not to sit down and polish off the entire thing by myself. Of course I still love my Kraft mac and cheese, but if you've got an hour on your hands and are craving comfort food, this is for you. It's way easier than it probably sounds. But do it on a day when you're not feeling "all that" because after one bite people start showering you with compliments. It's a total ego boost! 1. Preheat oven to 375 degrees. Cook bacon in a skillet over medium heat, stirring occasionally, 6 - 8 minutes or until crisp; remove bacon and drain on paper towels. 2. Cook leeks in 4-qt boiling water in a large Dutch oven 5 minutes. Remove leeks with a slotted spoon, reserving boiling water in Dutch oven. Plunge leeks into ice water to stop the cooking process; drain. 3. Add pasta to boiling water and cook 10 minutes or until al dente. Drain. 4. Melt butter is a large skillet over medium heat. Reduce heat to medium-low, and whisk flour until smooth; cook, whisking constantly for 2 minutes or until golden brown. Slowly whisk in milk and cook, whisking constantly, 3 minutes or until thickened. Whisk in dry mustard and next 3 ingredient, and 1/2 cup Cheddar cheese, stirring until cheese is melted. Remove from heat. Season with salt to taste. 5. Gently stir together pasta, cheese sauce, half each of cooked bacon and leeks, and egg yolk. Stir in Gruyere cheese and remaining 1/2 cup Cheddar cheese. Spoon pasta mixture into a buttered 8-in cast-iron skillet or baking dish, and sprinkle with remaining bacon and leeks. Drizzle with cream; sprinkle with breadcrumbs on top. 6. Bake at 375 degrees for 35 minutes or until golden and bubbly. Let stand 15 minutes before serving. "This recipe's roots are classically Southern with the hearty addition of leeks and bacon. I also like to use Canadian Cheddar, which reminds me of my childhood growing up outside of Ottawa. The dish, like me, is a lot of Canada happily enmeshed in the South." Knox blox on the ceiling....how decorative! Let's see what you can create by balancing a spoon on your nose at the dinner table or pouring salad dressing on your head...happpy memories.